What educators need to do is to make the pedagogical more political by addressing both the conditions through which they teach and what it means to learn from a generation that is experiencing life in a way that is vastly different from the representations offered in modernist versions of schooling. The emergence of the electronic media coupled with a diminishing faith in the power of human agency has undermined the traditional visions of schooling and the meaning of pedagogy. The language of lesson plans and upward mobility and the forms of teacher authority on which it was based have been radically delegitimated by the recognition that culture and power are central to the authority-knowledge relationship. Modernism’s faith in the past has given way to a future for which traditional markers no longer make sense. Postmodern discourses offer the promise, but not the solution, for alerting educators to a new generation of border youth. Indications of the conditions and characteristics that define such youth are far from uniform or agreed upon. But the daunting fear of essentializing the category of youth should not deter educators and cultural critics from addressing the effects on a current generation of young people, who appear hostage to the vicissitudes of a changing economic order, with its legacy of diminished hopes, on the one hand, and a world of schizoid images, proliferating public spaces, and the increasing fragmentation, uncertainty, and randomness that structure postmodern daily life, on the other. Central to this issue is whether educators are dealing with a new kind of student forged within organizing principles shaped by the intersection of the electronic image, popular culture, and a dire sense of indeterminacy. Differences aside, the concept of border youth represents less a distinct class, membership, or social group than a referent for naming and understanding the emergence of a set of conditions, translations, border crossings, attitudes, and dystopian sensibilities among youth that cuts across race and class and that represents a fairly new phenomenon. In this scenario, the experiences of contemporary Western youth in the late-modern world are being ordered around coordinates that structure the experience of everyday life outside of the unified principles and maps of certainty that offered up comfortable and secure representations to previous generations. Youth increasingly rely less on the maps of modernism to construct and affirm their identities; instead, they are faced with the task of finding their way through a de-centered cultural landscape no longer caught in the grip of a technology of print, closed narrative structures, or the certitude of a secure economic future. The new emerging technologies that construct and position youth represent interactive terrains that cut across “language and culture, without narrative requirements, without character complexities. . .. Narrative complexity [has given] way to design complexity; story [has given] way to a sensory environment”. A postmodern pedagogy must address the shifting attitudes, representations, and desires of this new generation of youth being produced within the current historical, economic, and cultural juncture. For example, the terms of identity and the production of new maps of meaning must be understood within new hybridized cultural practices inscribed in relations of power that intersect differently with race, class, gender, and sexual orientation. But such differences must be understood not only in terms of the context of their struggles but also through a shared language of resistance that points to hope and possibility. This is where the legacy of a critical modernism becomes valuable: it reminds us of the importance of the language of public life, democratic struggle, and the imperatives of liberty, equality, and justice. Educators need to understand how different identities among youth are being produced in spheres generally ignored by schools. Included here are an analysis of how pedagogy works to produce, circulate, and confirm particular forms of knowledge and desires in those diverse public and popular spheres in which sounds, images, print, and electronic culture attempt to harness meaning for and against the possibility of expanding social justice and human dignity. Shopping malls, street communities, video halls, coffee shops, television culture, and other elements of popular culture must become serious objects of school knowledge. But more is at stake here than an ethnography of those public spheres in which individual and social identities are constructed and struggled over. More important is the need to fashion a language of ethics and politics that discriminates between relations that do violence and those that promote diverse and democratic public cultures and through which youth and others can understand their problems and concerns as part of a larger effort to interrogate and disrupt the dominant narratives of national identity, economic privilege, and individual empowerment. Pedagogy must redefine its relationship to modernist forms of culture, privilege, and canonicity and serve as a vehicle of translation and cross-fertilization. Pedagogy as a critical cultural practice needs to open up new institutional spaces in which students can experience and define what it means to be cultural producers capable of both reading different texts and producing them, of moving in and out of theoretical discourses but never losing sight of the need to theorize for themselves. Moreover, if critical educators are to move beyond the postmodern prophets of hyperreality, politics must not be exclusively fashioned to plugging into the new electronically mediated community. The struggle for power is not merely about expanding the range of texts that constitute the politics of representation; it is also about struggling within and against those institutions that wield economic and cultural power. It is becoming increasingly fashionable to argue for a postmodern pedagogy in which it is important to recognize that “one chief effect of electronic hypertext lies in the way it challenges now conventional assumptions about teachers, learners, and the institutions they inhabit”. As important as this concern is for re-figuring the nature of the relationship between authority and knowledge and the pedagogical conditions necessary for decentering the curriculum and opening up new pedagogical spaces, it does not go far enough and runs the risk of degenerating into another hyped-up, methodological fix. Postmodern pedagogy must be more sensitive to how teachers and students negotiate both texts and identities, but it must do so through a political project that articulates its own authority within a critical understanding of how the self recognizes others as subjects rather than as objects of history. In other words, postmodern pedagogy must address how power is written on, within, and between different groups as part of a broader effort to reimagine schools as democratic public spheres. Authority in this instance is linked to autocritique and becomes a political and ethical practice through which students become accountable to themselves and others. By making the political project of schooling primary, educators can define and debate the parameters through which communities of difference (defined by relations of representation and reception within overlapping and transnational systems of information, exchange, and distribution) can address what it means to be educated as a practice of empowerment. In this instance, schools can be rethought as public spheres, actively engaged in producing new forms of democratic community organized as sites of translation, negotiation, and resistance. 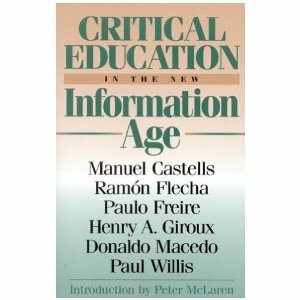 In addition, a postmodern pedagogy needs to go beyond a call for refiguring the curriculum so as to include new information technologies. It needs to assert a politics that makes the relationship among authority, ethics, and power central to a pedagogy that expands rather than closes down the possibilities of a radical democratic society. Within this discourse, images do not dissolve reality into simply another text. On the contrary, representations become central to revealing the structures of power relations at work in the public, schools, society, and the larger global order. Difference does not succumb to fashion in this logic (another touch of ethnicity); instead, difference becomes a marker of struggle in an ongoing movement toward a shared conception of justice and a radicalization of the social order.